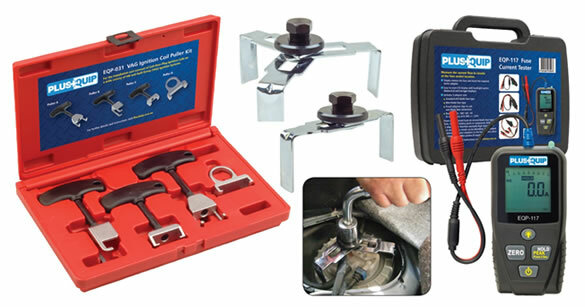 The PlusQuip range of workshop test equipment continues to expand with a VAG Ignition Coil Puller Kit, a Fuel Tank Lock Ring Removal Kit, and a Fuse Current Tester now included. The PlusQuip EQP-117 Fuse Current Tester can measure the current flow in circuits at the fuse socket location, by simply removing the fuse and inserting the required tester adapter. With the peak amp monitor function any unusually high intermittent current draw in the circuit that may cause the fuse to blow and open circuit can be identified. The EQP-117 Fuse Current Tester kit includes three adapter sets including one for standard ATO blade type fuses, a smaller adapter for Mini blade type fuses, and a harness with fused alligator clips to suit non blade fuse connectors. This allows the technician to perform circuit current tests on several blade fuse type sockets, or where a blade fuse connector is not available such as the battery posts or at the component. The standard 4mm diameter banana adaptors on the harness also allow compatibility with other probes if required. The PlusQuip Fuse Current Tester offers a measuring range of 30A / 48V / DC / AC and features a large LCD display with a backlight option, a numerical and analogue bar type display function, and a HOLD and ZERO function. This is a time saving device that all technicians should possess for current draw and circuit diagnosis. The EQP-030 Fuel Tank Lock Ring Removal Tool ensures that an even force is exerted on the plastic retaining nut during an in tank fuel pump module removal and refitting procedure, saving time and reducing component damage. This kit includes two adjustable diameter sockets, a 2 lug socket for retaining nuts from 80 - 122mm diameter and a 3 lug socket for 75 - 160mm diameter, to suit a wide range of vehicles with in tank fuel modules. The PlusQuip range includes products for the professional technician involved in the diagnosis and service of engine management systems. PlusQuip products are workshop quality and all come with a 12 month warranty and technical support. For more information or to locate your local stockist visit www.plusquip.com.au.